Holy Family Parish Festival: Save the Dates! Our 15th Annual Parish Festival will be from July 31 to August 4, 2019! Donations are now being accepted for the Century Club and the new Anniversary Club, or to be a Bronze Donor, Silver Donor or Gold Donor. Donation forms are in the bulletin or at the parish office. We are looking forward to seeing you at the festival this year! Holy Family Parish is pleased to announce that we have signed up for a FREE one year subscription to “FORMED” for our parishioners. 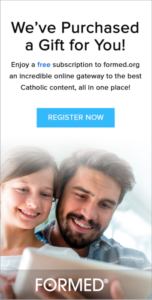 FORMED On Demand is a subscription service offering access to thousands of studies, films, audios, and eBooks from over 40 of the best Catholic content producers. To access FORMED, please click on the link http://holyfamparma.formed.org to create an account using your email address. Please contact Brian or Michele Bizzi at bbizzi@holyfamparma.org with any questions or comments. Congratulations to Holy Family School! Our school has received the ROSE Award (Recognition of Something Important) from the Diocese of Cleveland for their performance on the Winter MAP test. Our school’s performance on this test is among the top ten schools in our diocese! Please click on the following link to read the article featured on Cleveland.com https://www.cleveland.com/community/2019/04/parmas-holy-family-catholic-school-awarded-growth-award-for-math-language-arts-and-reading.html Please remember to drive safely around the parking lot and surrounding area. For more information or a tour of Holy Family School (grades Kindergarten through 8), please call 440.842.7785. Holy Family Childcare/Preschool is also accepting registrations for their 5-star Step Up to Quality Preschool programs for 3, 4 and 5 year olds. For more information please call 440.886.4717. Full-time and part-time slots are available during the school year and year round. For more information regarding upcoming events, please review our weekly bulletin tab located above or contact the Parish office. 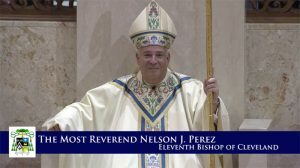 God Bless Bishop Nelson J. Perez ! We, the people of Holy Family Parish in Parma, Ohio, were established in 1872 as a community of Catholic faithful; We worship God in the celebration of the Eucharist; We evangelize through Jesus Christ, sharing the great message of salvation; We foster community as a spiritual home for all in our parish; We promote Catholic education and faith formation for all ages; We extend loving service to the poor, sick, and needy; We develop Catholic leaders and encourage participation in ministries by using our time, talent, and treasure; We strive to follow the example of Jesus, Mary and Joseph, the original Holy Family.